Before I begin, I would just like to say that this is not an article bashing my natural sisters out there. I appreciate our hair. The versatility of our hair is amazing, as we can wear our hair short, long, curly, bald, wavy, thick, super thick etc. 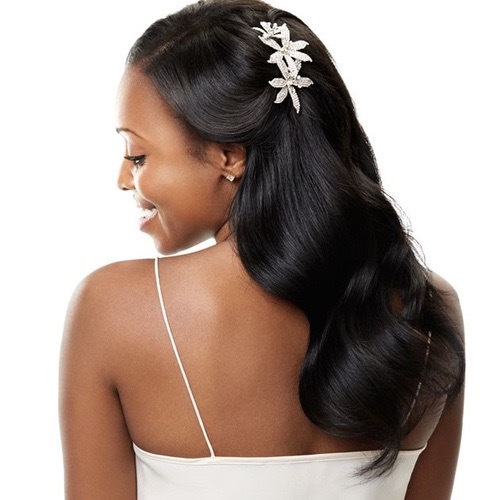 There are also many wedding hairstyle for long hair. We as women of color are the trailblazers for trends in the hair world. With that being said, y’all gotta chill. I am a young, African American woman whose hair is relaxed. Yes, there are still some of us out there who have stayed down for the “Creamy Crack” after all these years. It works for me, and I just don’t feel like I should have to change it. Why should I have to? But some people are deeply bothered by that. I have an appreciation for my natural sisters and everything it takes to maintain natural hair. I credit my line sister for putting me on game. I can remember the many nights we spent on the phone while she fussed about her hair the whole time. But no matter what, her hair always came out flawless though. My hair is thick, goes a little past my shoulders, and is extremely neat and healthy. I only get my hair relaxed by a professional every two to three months. In the meantime, I wash my hair once a week and oil it with coconut oil. In addition I also oil it twice in a week and one more time right before a relaxer. I’m very stingy with the heat on it. There are times that I don’t even use heat when I wash. So you could that I am very particular with my hair. Right? I prefer to keep my hair the way it is, and it’s healthy. So why isn’t that enough for other people? I’ve had women and yes, some men debate me on why, although my hair looked, smelled, and flaunted healthy, was inferior to their natural hair. Every time I’ve encountered these conversations I’ve always laughed them off because I always thought that while the point they always try to make is clear, I just don’t care. I always said to myself “you like what you like”, but it wasn’t until one day during a conversation some co-workers and I were having about it that I became a little angry. One day, as we were getting ready to leave work and go home, one sister walked through with the bounciest, golden, afro I had ever seen. A black male coworker took notice and became very intrigued by her hair. He then looked at me and another girl that worked with us and asked what the difference was between her hair and our hair. The girl pulled off her hat and showed us her dark black, medium length,silk-like mane. She said that her hair was natural but it was straighten. He then looked at mine. I then pulled my ponytail out of the jacket hood I was wearing. “And this would be permed hair,” I said. Then my female coworker said, “she is trying so hard to be like a white girl. I almost lost my sh$t!! This wasn’t my first time hearing that. But I was just tired. I was tired of people telling me that I was something that I was not. I was tired of being judged and categorized. A white girl. I never understood what that meant. I was just being myself. I have an aunt who used to refer my siblings and I as “90210.” People have always said that I was trying to be something that I knew I wasn’t. From the way I talked, to the way I dressed, I was always ridiculed. I was always the outcast because of the way I was raised. It was me. I can remember being told by a college boyfriend that in order to get interviews as a journalist, I needed to add ebonics to my vernacular so black people would feel comfortable with talking to me. It’s truly insulting to be judged just for being yourself. But it has taken me years to be okay with the fact that some people will never accept me as a black woman because of the way I am and you know what? That’s fine. But now to be treated the same way as a result of the way I choose to style my hair? That’s real petty. The hair that grows everyday. The same hair that people cut off and add on to everyday. So because I get my hair relaxed, I am trying to be something I’m not? Are you kidding me? Never mind that my skin was just as black as hers, or that I was just being myself. Why does it have to be an “us vs. us” thing? We need to stop finding new ways to divide ourselves as a people. What people need to realize is that first, having straight hair doesn’t make me any less black than you are just because you have natural hair.Secondly, my permed hair, just like your natural is something you preferred over the other. Nothing more. And lastly, why the hell does it matter. Is my getting a perm hurting you? No. Okay. If my hair is healthy, why is it an issue? Just like natural hair, if it is left untreated, the results could be not so flattering. It’s a struggle for us all. As I said before, this wasn’t to bash my natural sisters. It is just to say that there are still some relaxed sisters out here. We don’t appreciate being given a hard time by our own people. All types of OUR hair should be celebrated. That’s all I’m saying. It shouldn’t be one more than the other. No one should be made fun of or insulted for having one or the other. If it doesn’t hurt anyone, people shouldn’t be judged based on their preference. We should be unapologetically beautiful in every inch of their skin no matter how we express ourselves. 4 Comments on "Relaxed in a Natural World"
Thank you for this. I find it so odd when I’m judged for doing what works for ME and keeping it moving. When I compliment another woman on her hair, it’s to genuinely compliment her. Not to issue a backhanded snide remark. If you can’t issue that without a ‘but’, please…be quite. I’m very proud of who I am. There’s no self hate or desire to be anyone but me simply because I relax my hair.